Welcome to The Hangout! At our casual Restaurants in Orange County, experience Southern-inspired dishes made fresh from the finest ingredients. Our philosophy and aim are straightforward: Provide Good Food, Value, and Service with a unique take on classic fare that we know and love. Our Locally Owned Restaurants are ideal to hang out with friends, family, group dining, or fun anniversary date, Enjoy a fun, relaxed atmosphere that never disappoints. With a wide selection of New American Food & drinks. we can please just about anyone. Our menu offers a number of popular choices. Enjoy Fresh Seafood, Steaks, Chicken, Sandwiches, Salads, Pasta, appetizers, and more. Relax in one of the adjoining Full Bars with the best Beers on draft, unique Cocktails, or Californian Wine. We're proud to have been selected for the top 5 Best Bloody Marys in Orange County by CBS Los Angeles. Our spicy margarita. berry mojito, and mimosas are equally great. For beer tastings, try our craft beer flight to taste several in one sitting. Enjoy Breakfast nearby with convenient locations — we open early. Our expansive menu covers it all. Fresh pancakes, waffles, several great tasting omelettes, coffee or juice. For seafood, there is many grilled or fried dishes. Our Seafood Pots are best sellers with six different recipes and 3 broth choices. Other favorites are fish n' chips, grilled fish tacos, and the Shrimp Po' Boy. Locals say we have great burgers. There's 10 choices and fresh ingredients piled high! Garlic or Parmesan French are favored. On a budget? Don’t miss our restaurant specials. Locals and travelers recommend us as one of the best restaurants in Southern California. No reservations are needed. The Hangout is a casual Restaurant by the Pier. Good Food, Ocean Views, and great service is what we're known for. Our Seal Beach Restaurant on Main Street is minutes to great shopping. Take a walk on the Pier before or after your meal and breathe in the fresh ocean air. Want an ocean view restaurant that has a great variety of comfort food and a friendly staff that seems to know everyone in town? You will love the staff, the proximity to the beach, and above all….you will LOVE their Bloody Marys. Our Beach Bar Restaurant near Long Beach is only 7 miles away. We're easy to get to. For cyclists, there is a rack to lock and fasten your bike! There's no better way to explore. Open from 7:00 am!, enjoy a tranquil breakfast by the beach,Consider Rancheros or Jack Daniel's French Toast to energize your morning. For Brunch spots, we're ideal for your late morning or weekend festivities. Visit the best Seal Beach Bar on Main Street. The Hangout was selected for Thrillist's "top 23 beachside bars in Los Angeles." Get started with drinks from our award-winning bartender. Experience a lively atmosphere with good music. Relax with the latest Craft Beers on draft and unique Cocktails. Try the Drink of The Week. Drink an amazing Bloody Mary or Mimosa Cocktail with scenic views. Just need a quick bite? Try one of our amazing Appetizers, Sandwiches, Salads or popular Fish Tacos. 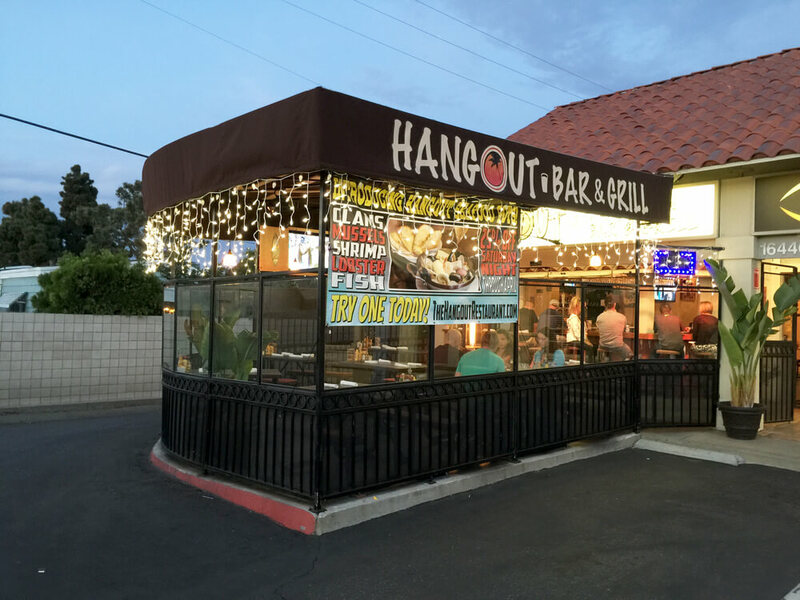 For outside dining, our Huntington Beach Restaurant Near Bella Terra is centrally located. It's a short drive from the Bolsa Chica Wetlands, Meadowlark Golf Club, and Huntington Harbor. Experience the same Good Food and Value in a smaller setting. The patio is ideal for Group Dinners. Locals love the cozy atmosphere and outside seating. Feel the breeze from the nearby harbor. As one of the few dog friendly restaurants, we're ideal for those coming from a day of sand and surf. Great local spot in Bolsa Chica tucked away in a nice little corner plaza a couple miles from the beach. We sat in the outdoor patio, which is almost like being indoor. We brought our dog and it felt very homey. Our Southern-inspired food portions are right on point. A must try is the classic Jalapeño Margarita Cocktail, Bacon Mac n' Cheese Balls or Sliders (Pork and Salmon) favorited by locals.For Vegetarian food, the Veggie Tacos get high marks! Our Outdoor Huntington Beach Bar has a rotating tap. It's perfect for a burger and beer with sports TV. Choose from the latest Craft Beers on tap! There is always something new as we bring in new brands. The range of Cocktails offers many choices. Unsure what to drink? Talk with our bartender for some unique suggestions. With multiple Flat Screen TVs and space heaters in cooler weather, you can relax outside. Watch the latest Sports Game with a cool local crowd. Experience a great local place to eat, hang out, and relax. With free parking and no time restrictions, there's no need to rush. From Sunset Beach it's just 2 miles and 3.4 miles from the Bolsa Chica Wetlands. You'll find the Staff Prompt, Cheerful and Helpful. We Open Daily from 7:00 am. You'll find the Staff Prompt, Cheerful and Helpful. We're described as casual fun places to eat, drink, and hangout. For bar and restaurants with a local vibe, locations are accessible near PCH and the 405. We're ideal to hang out with a group of friends or for a first date. With Friendly Service and a Knowledgeable Staff, we're a place to come back to that's just as welcoming as the first time. Experience dining at reasonable prices 7 days a week. We look forward to serving you! Craft Beer, Cocktails, Wine, Liquor.